Peacock Commons serves transition age youth ages 18 – 24. 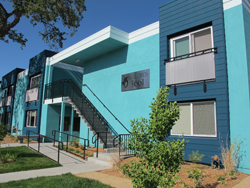 Peacock Commons provides permanent supportive housing to 45 transition age youth ages 18 – 24. This includes youth who are chronically homeless, at-risk of becoming homeless, aging out of foster care, or victims of domestic violence. A unique component of Peacock Commons, our twenty-eight unit apartment complex, is the inclusion of six mentors who live on the premises and serve as role models for the residents and help facilitate activities.